Researchers work with deadly pathogens inside the BSL-4 lab. 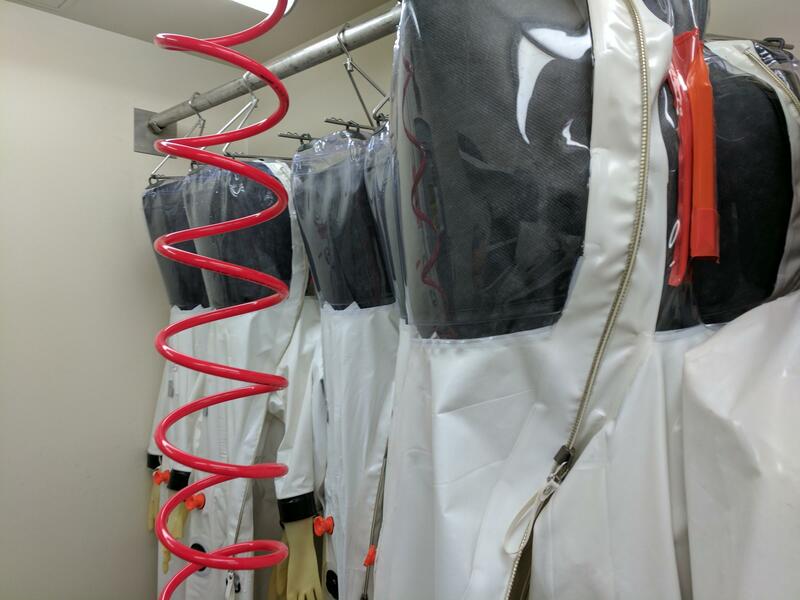 Robert Davey is zipping up a suit his scientists wear when researching deadly pathogens. Davey directs the Bio-Safety Level 4 lab at the Texas Biomedical Research Institute in San Antonio. We're surrounded by plastic suits hanging on racks the length of either side of the room. Davey blows this one up like a balloon. "And when you're ready to go in, you would then connect this hose -- which is the airline -- to the valve," Davey says as a loud hiss of air flows into the suit. Just a few feet away through a door that looks like it should be on a submarine, researchers develop vaccines and other countermeasures for the deadliest viruses like Ebola and Marburg. Davey closes the door with a resounding clang, and a gentle whir of the inflating air seals kicks in, interrupted by the beep of a walkie talkie from the operations person. "Yeah, lab pressures are all normal. That's fine," says the walkie. Anytime someone is in the lab, someone is in the control room monitoring. "There are a series of air locks to get into it, and each is pressurized in a certain way to stop the bad bugs getting out," says Davey. Texas Biomedical Research Institute is an independent, nonprofit research organization. On the 200-acre property, scientists research everything from cardiovascular disease and obesity to AIDS and infectious disease. But 40 percent of the Institute's revenue comes from this 1,200 square foot lab, and the lab is maxed out. "Right now it's 24/7," says Texas Biomed Virologist Jean Patterson, Ph.D. She says the institute is ready for a new and bigger lab. "At this point in time we are booked solid for two and a half years, and we've been that way for a couple of years now," she says. Outbreaks of infectious diseases -- including the likes of Ebola or Avian Flu -- have tripled globally since 1980. 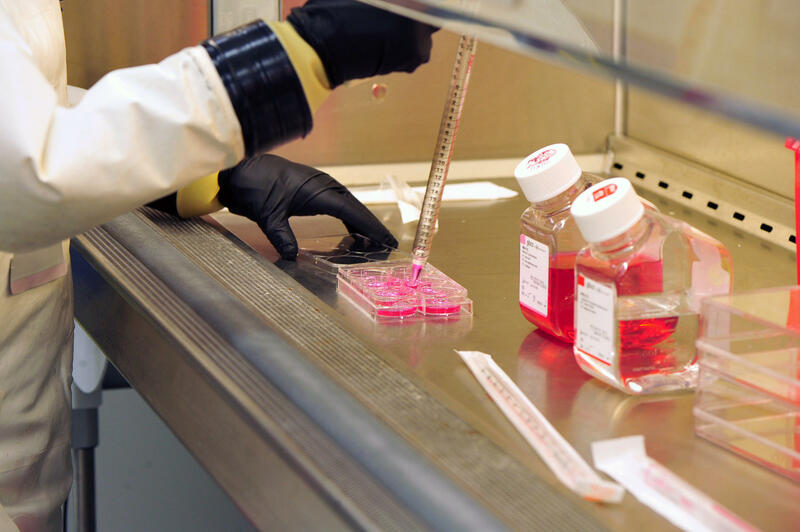 That increases the demands on the few labs in the U.S. that research deadly diseases. The lab makes $16 million a year in revenue because the lab is so busy. In four years, the organization has turned away $40 million worth of work. It isn't clear how many Level-4 labs exist in the U.S. because many are government-owned and -run, and they don't advertise what they do. The best estimate is less than 10 labs. "Well, it's absolutely critical," says Larry Zeitlin, president of MAPP Pharmaceuticals. His company holds the license on a promising anti-Ebola therapy, and he says without enough labs, getting the right therapy -- or in lab speak, the "proper antibody candidate" -- to market becomes impossible. "We can't show that a candidate works. We can't satisfy the FDA that the candidate is appropriate for development," Zeitlin says. Zeitlin often partners with the Galveston National Laboratory at the University of Texas Medical Branch. Galveston's Level-4 lab is more than 10 times the size of Texas Biomed's, and research is still booked 12-18 months out. Despite securing $121 million in contracts last year, Galveston National Laboratory Director Jim LeDuc says any lab should be cautious about expanding. "Simply because these labs are extremely complex, they're extremely costly to run and operate. And you need to make sure that there is sufficient demand today and a decade from now to keep them busy," says LeDuc. Galveston estimates it spends a million dollars a year just on utilities for its Level-4 lab. But Jean Patterson says Texas Biomed has done the research, and its lab expansion makes financial sense. "And more importantly, we're not getting the countermeasure out that we need. It's not just that we aren't making as much money. It's that we aren't able to provide the vaccine and treatments that are necessary to stop these outbreaks," says Patterson. Texas Biomed is still deciding how big to make its new lab but Patterson is confident once it's built, the lab will still be very busy.